Yalla Bowling Mirdif City Centre Dubai is yet another famous location in the capital of United Arab Emirates that is endowing awe-inspiring facilities. In a short span of time, this thrilling venue of bowling has accomplished in fortifying it self among the best places for enjoying bowling. Family oriented environment is yet another reason why people prefer coming here. Besides bowling, you can also involve yourself into various other video games. If you are fond of bowling then Yalla Bowling Mirdif City Centre Dubai will surely grant you an ideal offer through its discount offers; if you buy two Yalla Bowling tickets, one free ticket will be given to you. The lanes available at Yalla Bowling Mirdif City Centre Dubai are finely constructed and the usage of latest technology will allow visitors to enjoy quality services. Advance video simulation and a specific area for playing video games are also available. 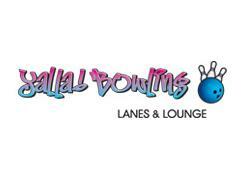 Yalla Bowling Mirdif City Centre Dubai remains open all seven days. From Sunday till Wednesday you can plan your visit during 10:00 am and 10:00 pm, whereas from Thursday till Saturday visitors are welcomed during 10:00 am till midnight. 1st Floor, Mirdif City Centre, Emirates Road In Playnation, Next to CineStar Cinema, Dubai, United Emirates. Distance of 1.3 kilometers between Mirdif City Centre and the nearest bus stop, Mirdiff City Centre 2 can be covered in 17 minutes by walk. 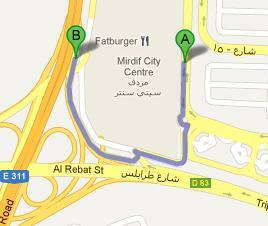 The only route that makes a stop here is F10 from Rashidiya Metro Station A2. After getting of the bus, head in the south direction and keep on walking until you cover 700 meters distance. Then take a sharp left turn and continue your walk, you will reach at your destination after covering 650 meters’ pace. For detail view of the pedestrian path click on this link.